Instructions: Cut chicken into cubes. Peel orange and separate into segments. Cut each orange segment in thirds, or halves if using clementines. Core apple and cut into pieces about the same size as orange pieces. Pour olive oil into dutch oven and heat over coals to about 375 degrees for Frying. Add chicken, onion, and garlic. Cut lemon in half and squeeze about 1 tablespoon of juice into the dutch oven, being careful to keep the seeds out. 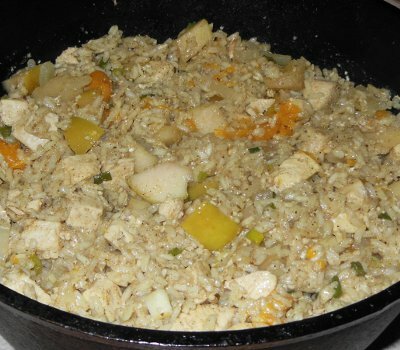 Mix in apple, orange, rice, and spices. Put lid on the dutch oven and lower heat to about 225 degrees for Simmering. Simmer for about 40 minutes, until rice is soft.